I started watching the Gilmore Girls (henceforth GG) during the good old days at U of T. Actually, I don’t even think I touched the show until 4th year when I needed new shows to watch since DC++ allowed all students in the know to watch entire series, in sequence. I had seen all the Smallville episodes, and various other shows I watched (it actually takes a lot for me to get into a show), so next came GG. I had previously trashed talked the brown-haired, blue-eyes, since it is one of those girl shows, but now I’m fairly sure I have seen every episode, possibly only missing a couple from the terrible 7th and final season. I thought I’d chronicle some of my feelings about the GG’s. Yes, sometimes I do love them, and enjoy the distraction they provide from my own non-Connecticut life, but so so often I hate hate hate them. Love – I love how hot and tall Dean is. Hate – I hate Logan the jag and his half open eyes. Love – I love that Lorelai and Luke are meant to be together. Hate – I hate that the show clearly complicates their relationship in ridiculous ways just to let the series continue. I mean, long lost 12 year old love child? I know April is supposed to be a genius, but could she talk through her nose any more forcibly? Love – Kirk. What more could you ask for in outlandish comic relief? Naked running night terrors, driving through buildings, plummeting to earth from a plane, recording himself in a practice date, leaving rotting eggs in the town square, and on and on it goes. I wonder what the actor is like as a real guy. There’s no way he’s normal, no one acts that well. Hate – Taylor. I know he’s some kind of plot-moving-forward character, but he never does anything new. It’s the same annoying crap every time. NOBODY CARES WHAT YOU THINK, TAYLOR. GET A FREAKING LIFE. Love – Lorelai more than Rory. Hate – Rory more than Lorelai. Love – Lane’s blue rainbow shoulder sweater. Hate – That Lorelai expects everyone to do everything she asks. She torments people until they give in. Its like that “pretty girl” syndrome, where no one ever says no to them, so they think they can do whatever the hell they want. Love – Rory’s short hair in season….. 3? 4? Hate – The stupid puffy shoulder, short sleeved jackets that Rory wears in EVERY episode of season 7. Hate – How bad an actress Emily (grandma G) is. Also those weird, rectangular jackets she wears. She allegedly has impeccable taste, but all I can see is shoulder pads, floral print curtains and poufy hair. Hate – Pretty much all the rich people portrayed on the show. Even the endearing ones. I think the thing I hate most about the show is how nothing bad ever happens to Rory, and how everyone around her can’t stop telling her how perfect she is. The worst thing that ever happens is that she steals a yacht and decides to drop out of Yale. This doesn’t even count as “something bad happening to her”, since she does it completely to herself. I’m not going to feel sorry for her because she’s not sure what her identity is anymore. Everything always falls into place – she gets into Chilton, she’s class vice president, valedictorian, gets into Harvard, Princeton and Yale, becomes editor of the Yale Daily News and has various other achievements. The second “worst” thing that happens to her is that she doesn't get the job at the New York Times, oh no! BUT, this misfortune lasts for like an episode until she gets a killer job as a journalist for a magazine following the presidential race. She’s so whiny and selfish, and tramples on many a boy, including Dean who’s nothing but hot. Everyone tells her how pretty she is, how crazy intelligent she is, how nice she is (although its very clear that she’s the worst kind of nice, the nice that isn’t really nice at all but mean and spiteful without realizing it). There’s so many other things I hate about Rory, especially post 4rd season Rory (when she becomes a homewrecker), but its making me angry just thinking about it so I think I should cut myself off here. Lorelai in comparison to her daughter is a saint. But she needs to get it together. Once you’re 40 you should be able to solve your problems without throwing temper tantrums and blaming it all on your parents. What are your thoughts on GG? Maybe you Love/HATE it more than I do. Posted by R at 8:33 p.m.
oh my gosh, bethany!! I spent the greater part of this year rushing home from work so that I could catch my daily GG, only to sit there and hate it - yet I kept coming back for more. I agree with you on everything except that I totally hate -- nay, loathe -- Kirk. oh yeah, and I hate Logan and totally agree re: Rory always getting what Rory wants. Oh, and another hate? Sookie's whiny husband. WTF? Okay, enough hating. One character I loved was Laine's boyfriend/husband. I love GG!!! I need to see the rest of S7, I don't know how it ends. I grew into Zach, Lane's husband/boyfriend. Their relationship always seemed a little weird to me and I hated how they broke up and then got married really quickly. Aww, I would put Emily in my love column, but I think I agree with everything else. Especially Taylor. Also: Hate Nicole and the random contrivance of Luke getting married to her. That wasn't Luke at all! I grew to love Paris, and by the end of the series I adored her. Well, who doesn't love Paris? I am a guy and only know the show b/c my wife begs me to watch it. (I make her watch "Star Trek" or "The X-Files" in return.) I agree about Kirk being funny, and I would like to add my favorite personal craziness: at the baptism of Sookie & Jackson's kids, someone compliments him on his suit and he says, "Thanks. It's the one my father was buried it." With no further explanation. I agree complete that Rory has led a charmed life and she has nothing to whine about. My wife has a friend who was raised under similar circumstances: her mom was a single parent who did everything for her daughter, was her best friend, they talked constantly about everything, they did everything together like going to the movies, to concerts, etc., and then one day they had a disagreement about something (akin to Rory deciding to take time off from Yale) and it caused such a huge fight that their relationship is not the same, almost 10 years later. The difference here was, there was no writing staff to script a happy ending. As far as Lorelai: I don't like to use words like "hate" (I've been engaged a private campaign to stop saying it as a dysphemism for "I don't like"), but I absolutely hate Lorelai Gilmore, more than ANY character on TV. She runs her mouth constantly, a constant volcanic eruption of sarcasm, witty pop culture references, petulant demands, etc. She doesn't act at all like a mother, like the episode when Rory is studying for a test at Chilton and Lorelai is the 10-year-old, wandering around the house bored, trying to distract Rory from studying. And when Rory misses the test, her way of handling the fall-out is to storm into the Headmaster's office and call him a fascist ("Il Duce"). She has no sense of how to handle things in a calm, professional way; she charges into everything with guns blazing, not caring who she hurts or bends to her will or who she alienates. The worst thing she does is when Rory drops out of Yale. A LOT of college students get overwhelmed and take time off. I did, and I went back after a couple of year-long breaks and got my degree. I know tons of people who've done this. And I agree that Emily and Richard should have told Lorelai that, in discussion with Rory, they were considering changing their minds. But Lorelai's childish behavior is inexcusable. She launches a selfish campaign of ignoring her own daughter. When Emily asks Lorelai to help her gather up Rory's things so she can have something to wear to court, Lorelai sends Michele over to let Emily into the house, only for her to find that Rory's things are not packed--a deliberate slap in the face. She refuses to support her daughter by coming to the court hearing. When she sees her performing her community service at the roadside, she stops and picks a fight with her for no reason. She actually says, in an angry tone, "So, repaying your debt to the community, huh? ", as if Rory is somehow offending her by carrying out her sentence. She completely cuts her daughter out of her life, replacing her with a dog, and expects everyone around her to do the same (e.g., Luke), b/c her daughter has decided to take a little time off from school. And then, at the aforementioned baptism of HER BEST FRIEND'S CHILDREN, she actually interrupts the ceremony to have a fight with Rory. I swear, I hate this woman with a vengeance. She's a terrible parent, a bad friend who always twists your arm to get her way, and a petulant daughter who continues to blame her parents for everything they do even though she treats them like garbage and makes it clear to them (and to everyone in Stars Hollow) that she wants nothing to do with them. I doubt there's every been such an awful character in this genre of TV, ever. I say Amen to tanis118. Lorelai Gilmore makes me sick. Every move Rory makes Lorelai gets this sad puppy look on her face. When Logan proposes to Rory, the look on Lorelai's face was just pathetic. It was as if she didn't want Rory making the decision without first consulting her because she's an overbearing mother. Then, when Rory decides she needs time to think about the proposal, Lorelai offers next to no support, instead seems to enjoy the fact that Rory is so dependent on her that she can't make up her own mind about a marriage. Lorelai does not deserve Luke, her parents, or any of her friends. She's selfish, childish, and outlandish. The list is fairly complete, except I can't understand how EVERYONE can absolutely love Lorelai. She's just as immature as Rory - no, actually, I take that back. Lorelai is MORE immature than Rory because she's freakin' 40 years old and acts like she's a 3 year old in the cereal aise of a grocery store. She runs from her parents, blames ALL of her problems on them, treats them like scum, belittles them, insults them, and generally mistreats them... that is, until she needs money. Richard and Emily graciously offer to pay for Rory's education (Chilton, Yale), buy Rory a car, purchase a house for Lorelai and Luke, etc etc. They are wonderful parents (albeit a bit snobby, but so what) and she mistreats them horribly. 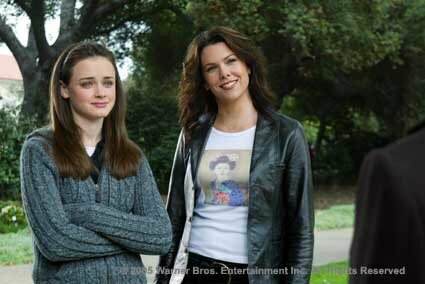 Personally, the show would be much better if a bus ran over both Lorelai and Rory, so that Luke and Dean would be avenged for being mistreated by two of the worst women in the world. I hate Lorelai Gilmore. She was rude, picked fights with everyone and expected everyone to just do everything for her and love her. She goes through guys like crazy and hops from one to another just like that when one makes her mad. She can't stay in a marriage let alone an engagement or relationship. I love Luke! Gosh best character ever! Lorelei should never have been allowed to be a mother. She's far too immature. Hate her. Running away from her parents like that was a good decision at the time (just to get away from all the drama, she was getting a baby at 16 for gods sake!). She acts as if she is totally immature but that's just her charm - actually she's a brilliant self-made hard working woman who knows wrong from right better than Rory (the latter did not even want to warn Emily en Richard that Christopher had already payed for Yale, Lorelai was the one who told her that such a thing would be completely heartless and ungrateful). The whole not speaking thing: Rory was to blame there, I think. Lorelai shouldn't have pushed herself into Rory's life, that would only backfire, but I know that if Rory would have taken the first step, Lorelai wouldn't have slammed the door in her face. Rory was scared of facing Lorelai because she would get judged (and she sooo hates that), and Lorelai knew that, and she couldn't do anything about that anyway. The only thing about Lorelai that I can not explain is why she keeps hating Emily and Richard so much. They are very weird people but also concerned and involved parents. That definitely counts for something. The person I really really hate is Rory, for all the reasons stated above. Blugh. You hate how bad of an actress Kelly Bishop (plays Emily) is? Are you kidding? She is by far the best actress in the show. The woman knows how to act. I just began binge watching the show recently and I'm trying to finish up S4. I cannot STAND Rory! She's even more self centered than Lorelai! She dumps this guy and dumps that guy and can't seem to make up her mind and teases them and strings them along - UGH!